Product #46586 | SKU 9.VBROD5 | 0.0 (no ratings yet) Thanks for your rating! 9.Solutions Rigging is a method of building, supporting, and suspending a camera or lighting equipment in different ways on a movie set or in a photographic studio when conventional support does not accommodate the equipment. Therefore, the 16mm Rod Set from 9.Solutions aids in building this kind of support. 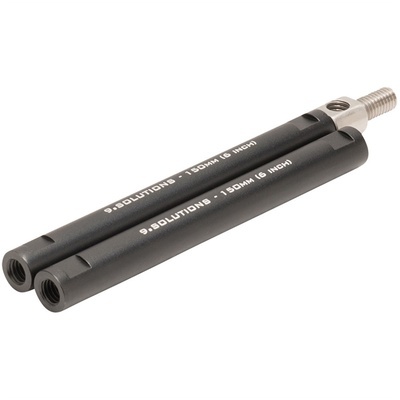 The 5.9" long rods connect together with the included rod connector which has the same 3/8"-16 thread diameter as the rods on each end. At the same time, the rod connector enables the rods to connect at a 90° angle. Moreover, the aluminium Rod Set is compatible with a variety of rigging accessories such as gags, clamps, and suction cups. Because of 3/8"-16 thread diameter, 9.5mm rods are capable of attaching to 16mm rod via the rod connector.